So the first Invitational of Iron Sleet has finally been announced. Huzzaah! I personally can’t wait to see what amazing stuff all the participants will be showing to us. This will be grand! Here’s my own plan for the challenge. This is going to be a perfect opportunity for me to give a much needed boost for my slowly growing showcase Red Corsairs project (which is two Renegade Astartes at the moment…) and explore the depths of their ranks with even wider perspective. My plan is to make a set of three very different kind of characters for the lot. Where their physical forms will differ quite a lot from one to another, their postures and general aesthetics will be telling a narrative and tie them together. I will be revealing more about each one of them during the process, so keep an eye for this blog. Long story short, please allow me present the first WIP character of my Invitational, the Dreadnought. Brother Cristos Savacius, Murderer of the Prophets, Butcher of Ere’gaz. There’s still very much to do, but the key elements are already there; pose, sarcophagus, evil claws etc. More spikes, a lot more skulls and much much more fine tuning to follow. 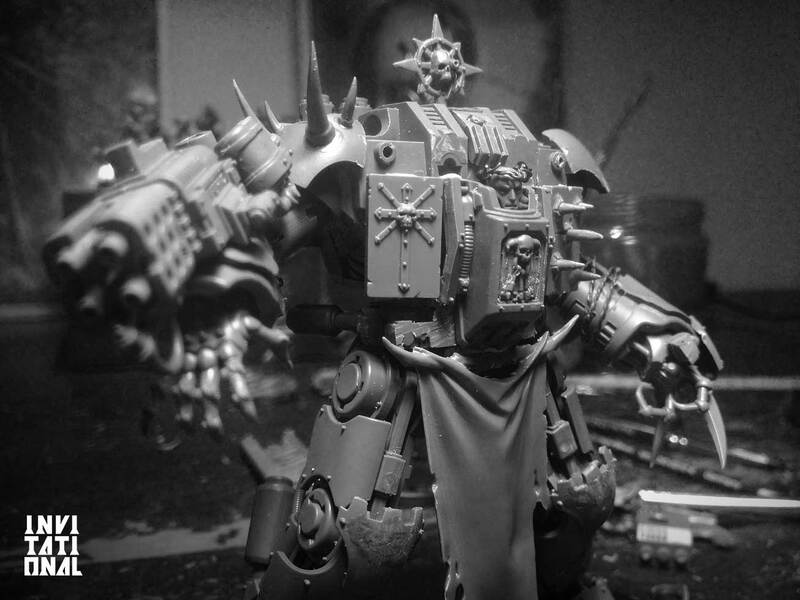 As some of you might notice, this beast of war is very much inspired by one of Migsula’s wonderful Dreadknight conversions as well as many other Dreadnought/Dreadknight kit-bashes out there. I could not help myself but to give it a try and make a similar version for my Red Corsairs project. The height of the Dreadknight along with its long agile limbs make it a perfect candidate for the upscaled Dreadnought, something that will look like a real dread when finished. I wonder if the head is a little too benign though – not that he needs to be a snarling maniac, but the face doesn’t seem quite grim and contemptuous enough to match the other Corsairs. Maybe he’s a benign entrepreneurial corsair who pirates the rich to feed the poor? Cheers Odie! This particular head was the only one I could find from my bits box that suited my plans, but may as well be changed if better candidate should appear. Oh man! looks incredible Kari!!! Love it. Much better than those terrible hellbrutes. Can’t wait to see its progression. A very nice start to an exciting project! If I may make a comment/suggestion, I think you should try to find different armoured plates for the sides of his torso. I recognize both from the old plastic Chaos Rhino upgrade kit, and don’t think either of them are very well designed. I always felt that they looked plain and generically “Chaos.” I feel that your incredible talent could make something far better out of plasticard. I think you could use it as a way to expand on the subtle themes that you have been working with, rather than settling for some existing parts. Either way, I can’t wait to see how he develops. I love the pilot’s crown of thorns. Thanks Gregory Wier! I’ll put your feedback behind my ear. Yeah, my vision is to keep it simple and crisp, but still chaotic enough to make his evilness stand out. Very nice start! I love Migs superdread and I can´t wait to see how your take on it ends up! 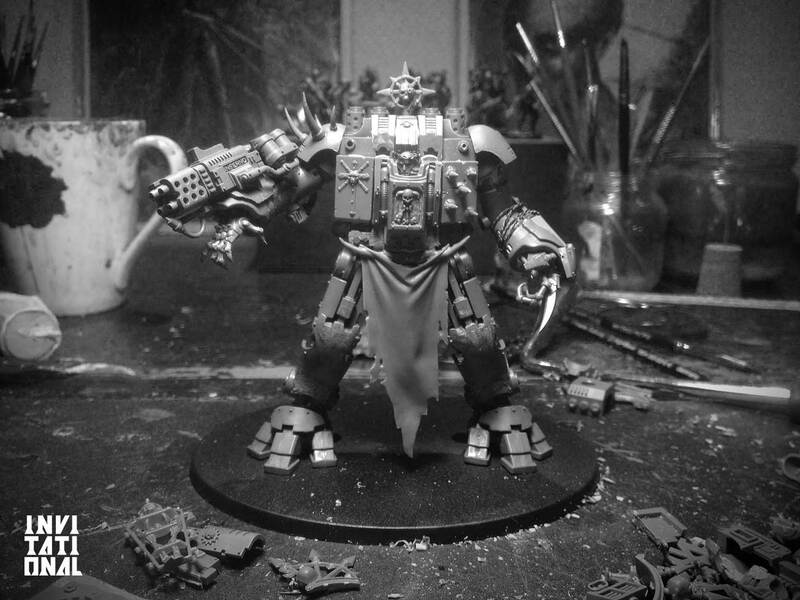 The banner-loincloth-thing is a little wide – it feels like it would get caught up in all the worky bitz. Perhaps some trimming might be in order? Thanks mate! I too love Migs’ dreads, but then again I wouldn’t want to simply copycat what he has done and instead try to move this project on the tracks of its own. Gotta check out if I’ll fix the banner-loincloth-thing somehow. Trimming sounds like a good idea. Awesome start to the Invitational! I have always had a soft spot for Space Marine Dreadnaughts. I like where you are going with your resized conversion. The hands in particular look fantastic, giving the walker a subtle and creepy vibe to it. The head used for it is also really cleaver and different. The crown of thorns is a wonderful touch. I think the wrist mounted cannon maybe a little large for my tastes. As it stands your attention is drawn away from the main body of the walker (the most interesting and important aspect of the model I believe) and to the massive flamethrower/cannon. I think the same is also partially true for the walker’s legs. They are incredibly long and divert your attention away from the body of the war machine. I think the extended pose of the legs further emphasizes how unusually tall the model is. I think the model would benefit from a slight reduction in leg length and/or a slight modification of the leg posing. Keep up the great work! I can’t wait to see where the model goes from here! Thank you for your comment, Adam! The problem is, if I shorten his legs, I would have to shorten his arms too. Otherwise it would look like an ape. It could be done, but I’m not sure if it is worth the effort (and even possible for me in such a tight schedule). I might leave it to the painting stage to determine which part will draw the most attention.